The Tuareg tribe of North Africa have long captured the imaginations of outsiders. These people of the Sahara, sometimes called the “blue people,” are instantly recognizable as the quintessential desert warriors. Among the members of the tribe, it is the men, not the women, who are veiled. They wear visually striking and elegant indigo head wrappings that protect against the harsh climate and stain their skin. This tribe of nomadic pastoralists are descendants of the indigenous Berber people. In addition to the impressive reputation they hold as warriors, the Tuareg also excel in trade, having long controlled the routes that traverse the Sahara, which include parts of Mali, Niger, Mauretania, Morocco, and southern Algeria. The Tuareg have been long admired for their sophisticated culture. They are famous for their traditions of sublime poetry, song, and dance, as well as beautiful visual works that are made by a special caste of artisans. In particular, mats made of reed and leather combine the intricate forms and motifs of North African Islamic art along with pre-Islamic ones indigenous to North Africa. The Tuareg also excel at metalworking and examples of their jewelry can be found at museums throughout the world. 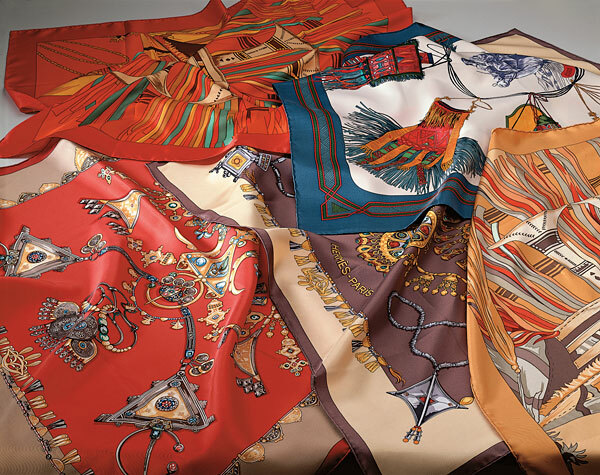 Some of the elaborate pectoral pendants have even served as inspiration for a collection of Hermes scarves that feature Tuareg ornament. Courtesy Cantor Arts Center, Stanford University. 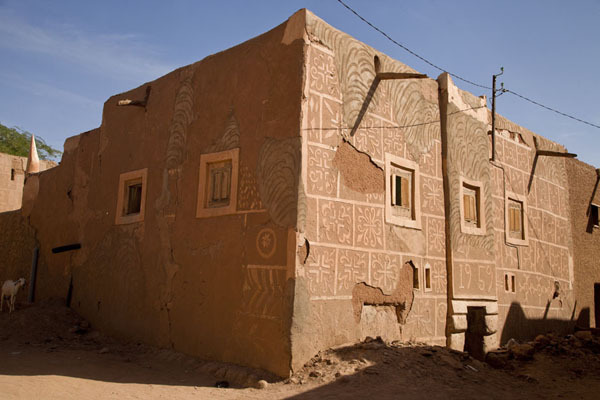 The Tuareg mats are at the center of the nomadic tents of the tribe and also sometimes form movable walls. 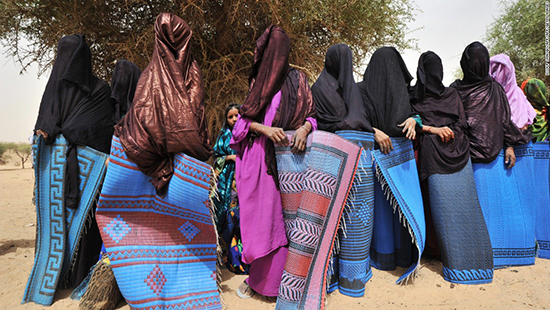 Tuareg women have particularly high status and independence within the tribe and are considered to be the owners of the tents and mats that form the tribe’s communal space. 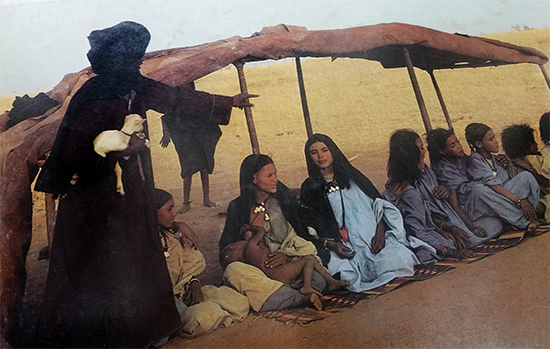 Because of the Tuareg’s nomadic lifestyle, the mats are lightweight and easily rolled. 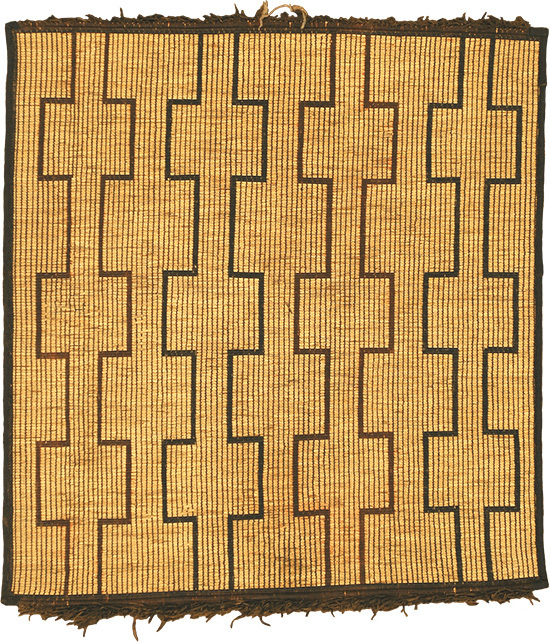 FJ Hakimian’s large collection of Tuareg mats exhibits the entire spectrum of the artistry of the Tuareg. 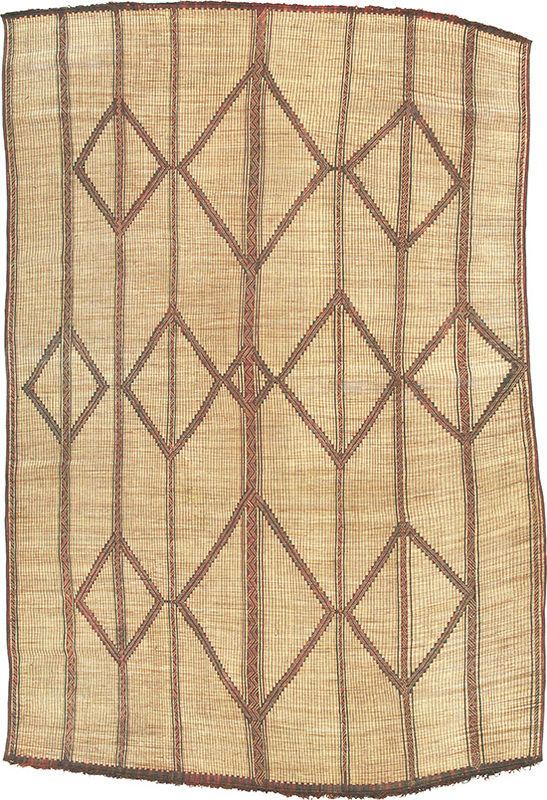 There is an enormous variety of patterns and motifs in the collection and each mat is unique. The elaborate designs are made of woven camel and goat leather, including checkerboard patterns containing protective ornaments, lattices, crosses, crenellated diamonds, zigzags, and austere stripes. Most designs also contain pre-Islamic decorations meant to be not only beautiful but also useful: the auspicious symbols act as protection against bad luck and ward off evil. Some of these same symbols appear in the town of Agadez, Niger, which is something of a permanent base for the tribe. On the buildings in the 14th century town the sides of buildings are beautifully decorated with some of the same symbols as on the mats and other art objects. 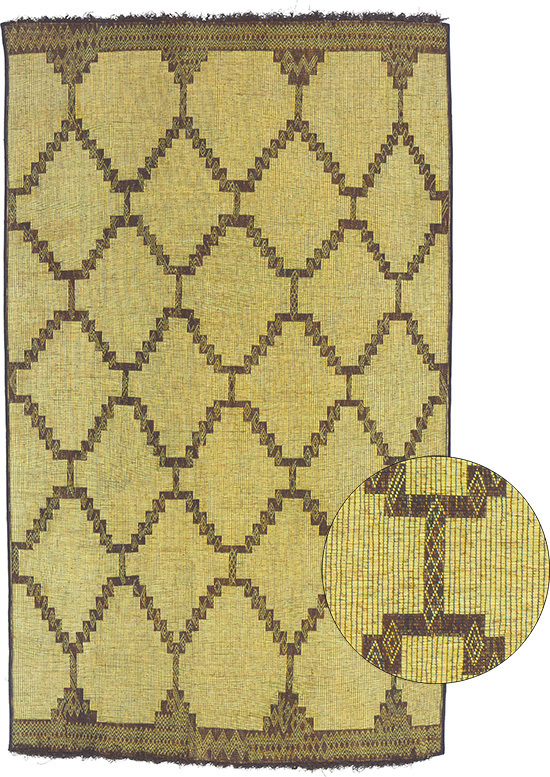 Because of their extraordinary craftsmanship and visual force, Tuareg mats have been popular with top interior designers. The natural materials add texture to the design of a room, and the very modern-looking forms add interest as well as a worldly element to a variety of interior projects.